The 2008-09 season was setting up nicely for Martin Brodeur. He was likely to set all time NHL records for wins and shutouts by a goaltender, all but crowning him as the greatest goalie of all time. After a strong start, a torn bicep shelved the New Jersey Devils great for four months, and certainly putting any coronation on indefinite hold. So what is Marty doing for four months? 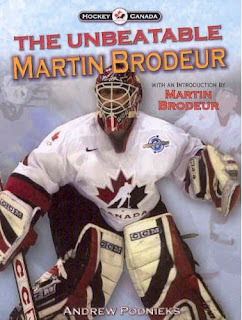 Perhaps he has spent some time reading Andrew Podnieks new book The Unbeatable Martin Brodeur. Actually, it is more likely that he has spent time promoting the title. That is because he is well aware of the juvenile title, cooperating fully with Podnieks. Brodeur wrote the introduction himself, and had his father supply all the color photos in the book. Published by HB Fenn, the 96 page paperback is an easy read. Podnieks nicely chronicles Brodeur's childhood right through to his Stanley Cup and Olympic glory. The book is a fast, action-packed look at one of hockey's extraordinary nice guys. After looking at his youth and junior hockey days, the book turns to Brodeur's meteoric rise into hockey's top goaltender. From his rise to the top to his three Stanley Cup championships, from his Olympic and World Cup gold medals to his chase of once-untouchable NHL records, Brodeur's biography is a very convincing argument that he really is the greatest goaltender of all time. The photos nicely contribute to the exciting feeling about the book. For those of you who do not know, Martin's father, Denis, is one of the most famous hockey photographers of all time. He supplies some rare and interesting photos of son, such as Martin as a child playing road hockey, watching the Montreal Canadiens practice from the player's bench, and receiving one one one instruction from the great Vladislav Tretiak. Later we get to see Brodeur as a Devil wearing the unfamiliar #29. This book follows other Hockey Canada-related youth books published by H.B. Fenn and Company Ltd. such as, The Sensational Jarome Iginla, The Spectacular Sidney Crosby, and H.E.A.R.T. (Cassie Campbell). Watch for Dominate Dany Heatley later in November, as well. If you have a young hockey fan or a goaltender on your Christmas list, Andrew Podnieks' The Unbeatable Martin Brodeur would make for an affordable gift to place under the tree.